"K2 Granite," also known as "K2 Jasper"
An azurite granite found at the base of K2, the world's second-highest mountain. K2 granite: A piece of dry K2 Granite. A wet surface would increase the intensity of the blue azurite orbs. This piece is approximately 10 centimeters across, and the largest azurite orbs are about 1 centimeter across. "K2 Granite," also known as "K2 Jasper" and "raindrop azurite," is an extremely interesting rock and lapidary material from the Skardu area of northern Pakistan. It is like an eye magnet for anyone who sees it for the first time. It is a bright white granite that contains sharply contrasting orbs of bright blue azurite. The azurite orbs range from a few millimeters up to about two centimeters in diameter. On a broken surface or on the surface of a slab, the blue orbs look like drops of bright blue ink that splashed onto the rock. Upon closer examination, however, you will see that they are actually spherical in shape. The white granite is very fine-grained and composed of quartz, sodium plagioclase, muscovite, and biotite. Some specimens show strong alignment of the biotite grains and could be called "granite gneiss." Examination of the azurite spheres with a good hand lens or microscope reveals that the azurite is present along mineral grain boundaries, within tiny fractures, and as a "dye" penetrating the feldspar grains. The azurite is a secondary material that clearly formed after all of the other minerals in the granite had solidified from the parent melt. World's second-highest mountain: A view of K2, also known as Mount Godwin Austen, in the morning sun. 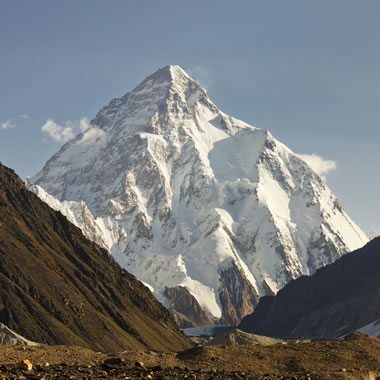 With a summit elevation of 8,611 meters, K2 is the second-highest mountain in the world after Mount Everest (8,848 meters), and ahead of Kangchenjunga (8,586 meters). Image copyright iStockphoto / PatrickPoendl. Many people see this material at mineral shows or lapidary shows and immediately think that the round blue dots have been produced with a dye. When they ask about the identity of the blue material and learn that it is "azurite," they usually have a hard time believing it because white granite and azurite rarely occur together. For most people, this is the first time that they have seen the two materials in such close association. Some specimens also have small areas that are stained green with malachite. In the close-up photo of K2 granite, you can see dozens of small green malachite stains. 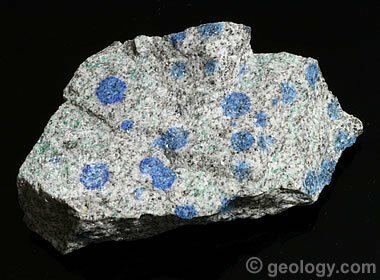 If you still doubt the “azurite in granite” identification, you might enjoy visiting a forum at mindat.org. There you will find experienced mineralogists, people from Pakistan who obtain K2 at its source, and lapidarists who cut K2 cabochons, discussing the material and sharing observations, photomicrographs, chemical analyses, and x-ray diffraction data. Azurite granite with malachite: The photo above features a close-up of a piece of K2 Granite. Dozens of green malachite stains can be seen in this specimen. 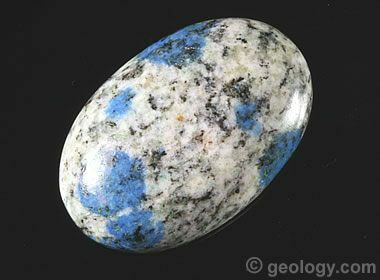 K2 cabochon: An oval cabochon cut from K2 Granite with several bright blue azurite stains. Within each stain you can see the texture of the granite and grains of black biotite. These indicate that the stain formed after the granite solidified from its parent melt. This cabochon is about 20 x 30 millimeters in size. K2 granite cuts, tumbles, and polishes beautifully. Due to its high feldspar content, it can be easily cut with a lapidary saw and shapes quickly on a diamond wheel. Although azurite has a Mohs hardness of 3.5 to 4, the blue dots have the same cutting and polishing properties as the surrounding white granite. This is because the azurite exists as a stain rather than as discrete mineral grains. K2 shapes and polishes well in a rock tumbler to produce tumbled stones. It also cuts attractive spheres. Cut beads are not seen in the marketplace. This is likely because if you cut ten pounds of K2 into 1-centimeter beads, very few of them will display the blue azurite color. K2 is relatively durable in jewelry. The feldspar minerals in K2 have a hardness of about 6 on the Mohs scale and will be scratched or show signs of wear over time if subjected to abrasion or impact. K2 is therefore not a good stone for mounting in a ring or bracelet. K2 attracts a lot of attention at gem and mineral shows. The rare combination of azurite in granite starts a lot of discussions, and even the occasional argument. Thus far, K2 is not extremely expensive. Great material can be purchased for about $30 to $40 per pound. This price is similar to what is paid for nice specimens of many popular agates and jaspers. 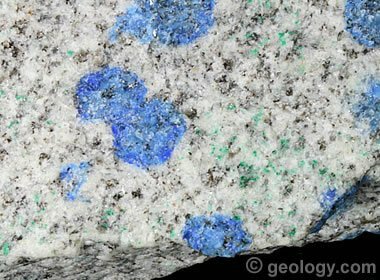 The best material has numerous, randomly spaced azurite stains on a bright white granite background.